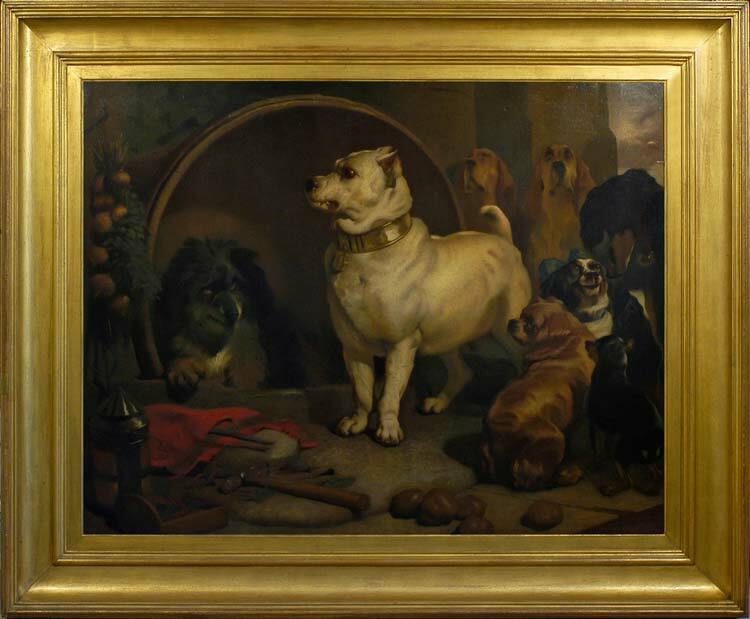 The original painting of Alexander and Diogenes by Landseer (Tate, London) was exhibited in 1848 and was inspired by the artist’s observation of a mongrel lying in a barrel and cheekily outstaring a haughty pedigree dog. This reminded Landseer of Alexander the Great’s encounter with Diogenes in his barrel. Alexander offered him help, and Diogenes replied that Alexander could help him by moving so as not to block out the sun. Charles Darwin apparently considered using a detail of ‘Alexander’s’ head from this work as an illustration of canine aggression in his book, The Expression of the Emotions (1872), which argues that the animal descent of man renders his facial expressions analogous to those of animals. Darwin may have been unconsciously influenced by Landseer’s skill at anthropomorphizing human expression through the faces and postures of animals. Landseer’s work was extremely popular from the 1830s; he enjoyed the patronage of the Queen and Prince Albert, and his Old shepherd’s chief mourner was praised by Ruskin for the ’emotion’ conveyed in the dog’s pose. Alexander and Diogenes was bought by Jacob Bell, founder of the Royal Pharmaceutical Society, friend, business agent and patron of Landseer; he bequeathed it to the nation in 1859, and it entered the Tate’s collection in 1897. Reilly’s is a very close copy, and was probably made in situ at the Tate Gallery. It faithfully evokes the original – the outrage of the Staffordshire bull terrier, the curmudgeonliness of the mongrel, the horror of the ‘entourage’ of spaniels, etc. See Diana Donald, ” ‘A mind and conscience akin to our own’: Darwin’s theory of expression and the depiction of animals in nineteenth-century Britain”, Endless forms: Charles Darwin, natural science and the visual arts, exh. cat., Fitzwilliam Museum & Yale Center for British Art, 2009. John Lewis Reilly was born in Madeira in 1835, and is described as a portrait and history painter (Benezit). He worked in Rome between 1863 and 1864, and from 1857-66 entered works in the Royal Academy, London. As well as portraits from life, he also produced copies of historic portraits: for example, a version of Velasquez’s Philip IV in the Frick collection, one of Thomas Phillips’s portraits of Byron, Raeburn’s Portrait of John Playfair and Stephen Pearce’s Portrait of Erasmus Wilson (Royal College of Surgeons). Works in public collections include Guido Reni painting the portrait of Beatrice Cenci the night before her execution, Palacio Nacional da Ajuda, Lisbon, and a portrait of Edward VII in his coronation robes, c. 1903, commissioned by the king, Royal Collection.